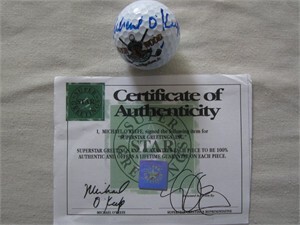 Caddyshack Bushwood Country Club logo golf ball autographed in blue marker by actor Michael O'Keefe, who played Danny Noonan. Witnessed and authenticated by Superstar Greetings, with their certificate of authenticity and plastic cube holder. NOTE: signature will vary SLIGHTLY as we obtained multiple golf balls from this signing.